Parker’s dual vessel cartridge / bag filter unit (TDW) is the most commonly used cartridge filter unit in the oil field sector. This offshore-proof, skid-mounted filter unit offers a cost-effective way to clean common oilfield fluids and fluid-waste streams. The unit is equipped with all necessary valves and safety features. 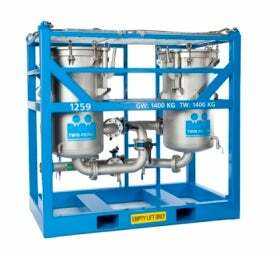 The unit performs simultaneous filtration with one vessel, while spent cartridges of the other vessel are replaced. Certified hoisting slings and forklift pockets allow the equipment to be lifted quickly and easily with minimal risk of damage.